Amazing who you meet at bicycle conferences. 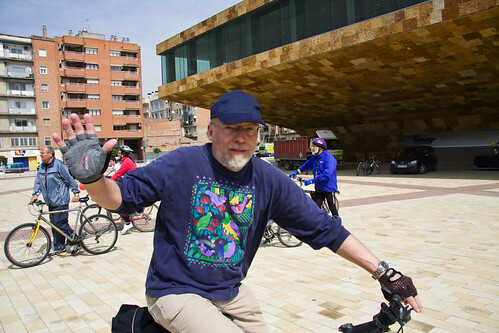 I had to travel all the way to Lleida, Catalonia to coincedentally make the acquaintence of this chap, Jens-Erik Larsen. He was also invited to speak and he covered the North Sea Bicycle Route, part of the impressive EuroVelo network, with over 66,000 of bike routes throughout Europe. Jens-Erik is part of De Frie Fugle (The Free Agents), which is a multidisciplinary consultancy company with more than 20 years of experience with projects dealing with ecological and sustainable practices, agriculture, environmental issues and outdoor life. Their aim is to promote an economically, ecologically and socially sustainable development of society - nationally as well as internationally. I was most impressed to learn that Jens-Erik had a really good idea back in the late 1980's. The creation of the world's first national bicycle route network, here in Denmark. It's always cool to meet the invididual who thought up impressive projects. So often you forget that it almost always is one person with one good idea and can only see the final result. If you need any consulting about national bike routes et al, be sure to contact The Free Agents.